Finally! I’ve been checking the DVD sites for a couple of years now, hoping that this movie would be released on DVD. It comes out on June 28. 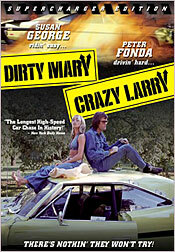 Dirty Mary Crazy Larry (1974) is being released by Anchor Bay Entertainment in what they are calling a “Supercharger Edition” with a few extra features. One is an all new documentary with cast and crew interviews. As cheesy as it is, this is one of my favourite movies. It’s one of the original car chase films from the early 70s that gave way to the Smokey and the Bandit series. The ending of the film was used each week in opening credits of The Fall Guy (1981-1986) television show, starring Lee Majors and Heather Thomas. It’s been out of print since the 80s making it a cult favourite by many. The only way to get it was through some “sketchy” archive companies in LA and Texas. I bought a copy several years ago on VHS. It will nice to finally see it in its original format and with Dolby Digital sound.